I love it when you have the ingredients in your cupboard to make a cake (and a darn good one at that) to take around to a friend’s place in the evening, or when you’re asked to bring a dessert. My friend had an attempted break-in yesterday, so while her hubby is away this evening we’re going to have a girl’s night… and that means cake! It also means a cake that ignores my usual preference for eating low-sugar foods. 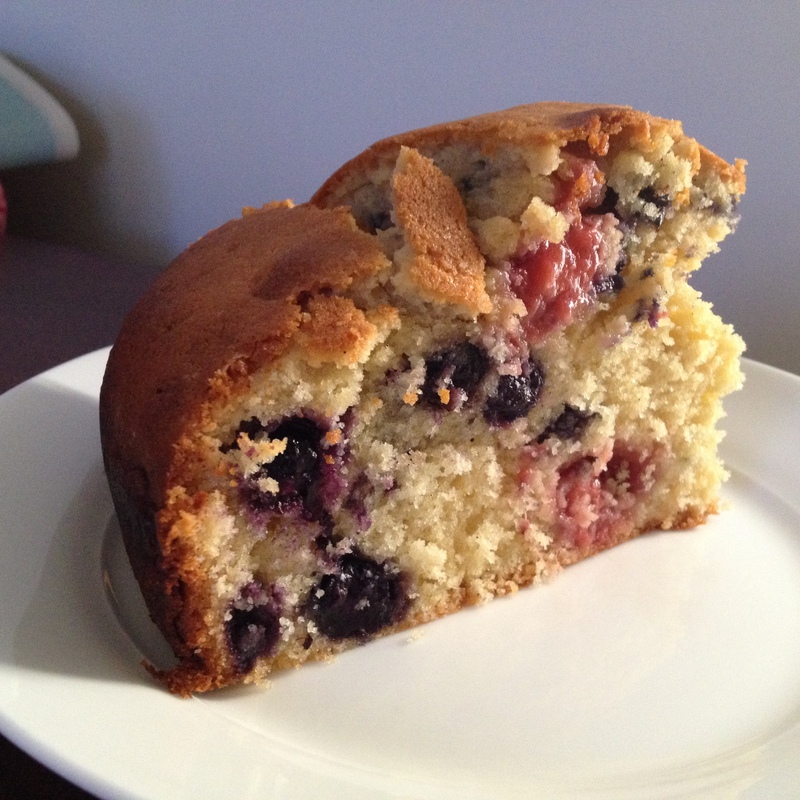 My stock standard cake is based on Maggie Beer’s Fresh Raspberry Cake with Sangiovese Verjuice Syrup. I made her version once before and ever since have left out some of the more expensive ingredients, like the fresh raspberries and the Sangiovese Verjuice syrup – the cake is good enough without it, and as what is now baking in my oven proves, a versatile base to either leave without the addition of fruit or to add whatever’s on hand. 2 cups frozen/fresh fruit of choice – blueberries/raspberries/strawberries/mixed etc. Preheat the oven to 180C. Grease the sides of a 20cm cake tin with butter and line the bottom with baking paper. Sift together flour, baking powder, salt, and baking soda in a large bowl and set aside. Put the butter and the sugar in the bowl of an electric mixer fitted with the paddle attachment and beat until light and fluffy. Add the vanilla extract. Beat in the eggs one at a time, incorporating each egg completely before adding the next. Incorporate the dry ingredients and the buttermilk/milk and lemon mixture, alternating between each, in two additions. Fold in the frozen fruit (or leave it out entirely) and pour into the prepared cake pan and bake for 40 minutes at 180 degrees and a further 20 at 140 degrees… I know that’s a little odd but that’s how I’ve got it to work!